The Newseum in Washington, DC is a high-tech, interactive museum that both promotes and explains, as well as defends free expression. Focusing on the five freedoms of the First Amendment—religion, speech, press, assembly, and petitions—the museum's seven levels of interactive exhibits include 15 galleries and 15 theaters. This museum was designed for the visitor to start at the top level and work their way down. There are seven levels, so plan to allow at least 4 hours if you want to explore each one. Some exhibits are not appropriate for young children, and the museum is best suited to ages 12 and up. While the exhibits at the Newseum are constantly changing, here are some of the most popular exhibits on display. 1967: Civil Rights at 50 tells the dramatic story of the growing militancy of the struggle for racial justice in 1967. 1776 – Breaking News: Independence showcases one of only 19 known copies of the first newspaper to publish the Declaration of Independence. This rare printing shows the declaration as Americans first saw it—as front-page news. First Dogs: American Presidents and Their Pets showcases images and stories about some of the top dogs who have resided at the nation’s most prestigious address. Today’s Front Pages shows 80 newspaper front pages from around the world, enlarged and updated daily from daily submissions exceeding 1,000. Electronic access is available to more than 450 front pages. Pulitzer Prize Photographs Gallery contains the largest and most comprehensive collection of Pulitzer Prize-winning photojournalism ever assembled. In a documentary film, photographers explain their craft. Visitors can access an electronic database featuring 300 video clips, 400 audio clips and 1,000 Pulitzer photos. 9/11 Gallery looks at how the media responded to one of the biggest news stories of the century. The gallery features Sept. 12 front pages from around the world, artifacts and a documentary of journalists' accounts of their reactions that day. Berlin Wall Exhibit features the largest collection of original Berlin Wall sections outside of Germany, this gallery examines the role of the media in the 30-year history of the wall. Journalists Memorial honors those who died while reporting the news by adding their names to a glass and steel memorial. A soaring, two-story memorial bears the names of more than 1,600 journalists from around the world. Great Books Gallery contains original books and other documents from the world’s great thinkers on free speech and freedom. Great Books displays 21 rare editions, from the Magna Carta to the Federalist Papers and the first pamphlet printing of the U.S. Constitution. The Interactive Newsroom is where visitors can play the role of a photojournalist, editor, reporter, or anchor at 48 interactive kiosks. Make Some Noise explores the new generation of student leaders of the civil rights movement who exercised their First Amendment rights and fought segregation in the early 1960s. Ethics Center tests visitors in their news judgment against others while racing the clock to answer tough questions and assemble a newspaper front page. Greenspun Family Terrace features panoramic views of the U.S. Capitol, the National Gallery of Art, the National Archives, the Smithsonian museums and the Washington Monument. An 80-foot-long exhibit traces the history of Pennsylvania Avenue and the important news events that have taken place here, such as protests and presidential inauguration parades. 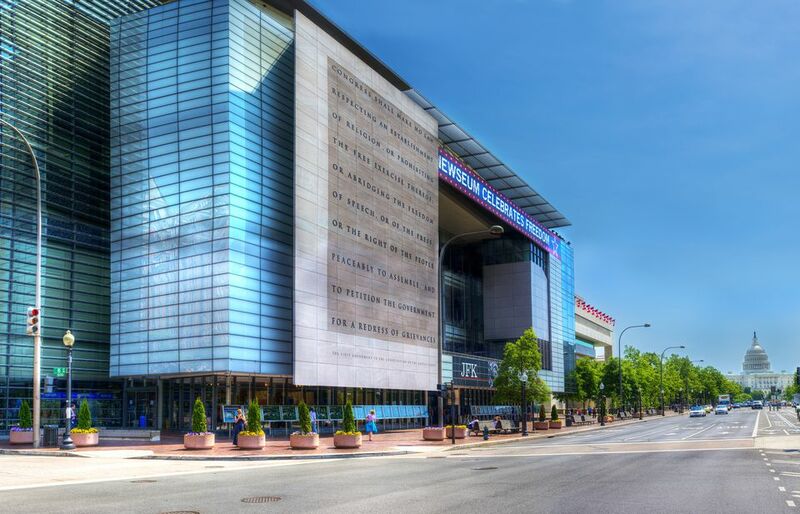 The 15 theaters at the Newseum offer visitors a variety of diverse viewing experiences including public programs, film screenings, debates, artistic performances and town hall gatherings. Visitors can watch technicians at the Broadcast Control Center controlling all aspects of the day-to-day activities in the entire museum. The Newseum is located at 555 Pennsylvania Ave. NW in Washington, DC and is sandwiched between the White House and the U.S. Capitol. It is also adjacent to the Smithsonian museums on the National Mall. The best and easiest way to get the Newseum is via the Metro. The two stations closest to the museum are Archives/Navy Memorial/Penn Quarter, served by the Green Line and Yellow Lines, and Judiciary Square, served by the Red Line. Another great way to travel to the Newseum is by bike. Capital Bikeshare offers over 1,600 bicycles in 175 locations around the DC area including Arlington, VA., and Alexandria, VA. The docking stations closest to the Newseum are on 6th and Indiana Ave. NW, 10th and Constitution Ave. NW, 4th and D Streets NW, and Maryland and Independence Ave. SW. Hours are subject to change without notice, so be sure to call ahead or check the website for updates. The Newseum admission rates are subject to change, so please consult their website for the most accurate rates. You can purchase tickets online in advance (generally for a discount) or at the museum admissions desk. Museum member visits are always free (with additional discounts for guests). Dining options include a food court and a fine-dining restaurant, The Source by Wolfgang Puck. There are four gift shops featuring news related items, books, and gifts.